Whitman Controls offers a diverse range of pressure switches. 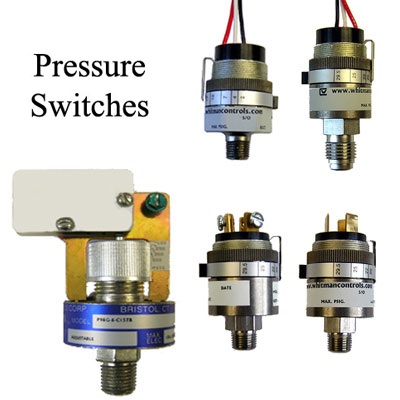 All of our pressure switches are of high quality and can be customized to fit your needs. We can build and ship a pressure switch to your exact specifications in two weeks or less. We offer a wide selection of set points and maximum system pressures to meet you process control requirements, along with lines of stainless steel and NEMA 4/6 switches to withstand the most difficult operating environments. When the conditions are harsh, Whitman’s products thrive - All with a lead time of two weeks or less! Contact our engineering department for fully customizable solutions for your end use. The P88G Economical Pressure switches are typically used in applications where reliable switch control supersedes accuracy of set point. Controlling on and off functions for fans and pumps where one may need a wide differential to prevent over-cycling is an ideal application use for the P88G. The P90 Severe Environment Pressure switches are built to operate in harsh conditions and are typically used in vehicle ap­plications both off road and on. As these switches are NEMA 6 rated, they are weather proof and briefly submersible. Ideal use is on log skidders, tractors, handi-vans, cranes and numerous other applications where shock, vibration and weather are of primary concern. The P95 Severe Environment Pressure switches are built to operate in harsh conditions and are typically used in vehicle applications both off road and on. As these switches are NEMA 6 rated, they are weather proof and briefly submersible. Resiliency in high pressure conditions is the key differentiator relative to its P90 sister switch, with the ability to withstand hydraulic spikes to 4,000 psig. The W117LG NEMA 4 Ultra Pure Stainless Steel Pressure Switches have all welded stainless steel interiors which are Helium leak checked to pass 4 x 10-9 Std cc/sec. These are the NEMA 4 rated weather-proof, liquid-resistant version of the W117G, suitable for out¬side applications or in areas of condensing humidity.